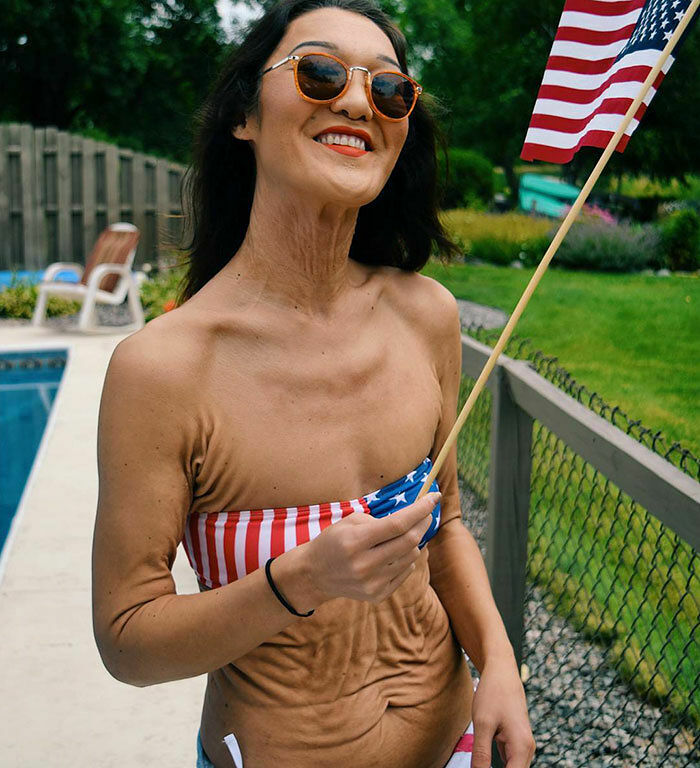 26 Year old body-positive model Sara Geurts has a rare skin condition called Ehlers-Danlos syndrome (EDS), the disorder affects the connective tissues supporting the skin, bones, and blood vessels. And although she's very young, it causes her skin to wrinkle as though she was much older. Bit for Sara Geurts it's a skin disorder that isn’t going to stop her from living her life to the fullest and pursue a successful modelling career. The skin condition inhibits the body's ability to produce collagen and this causes the skin to sag and wrinkle. And while 26 year old Geurts admits that it has caused her to feel insecure about her looks, as it would, she's also now embraced it. She's achieved this by deciding to confront contemporary beauty standards head on and become a model, proudly showing off her skin condition and challenging traditional perceptions of attractiveness. So not only is Geurts fighting prejudice of how she looks as a 26 year old, but she's also doing it while fighting the discomfort of the skin condition too. Originally from Minnesota Guerts has now moved to Los Angeles to pursue her modelling career. While there she hopes to change people's preconceptions and confront out culture's ideas of beauty. Even if that means confronting an industry built around convention. Follow Sara Guerts on Instagram here. Finally The Question Every Male On The Internet Wants to Know Is Answered—Does Size Matter?